Though recent cuts in congressional office budgets have applied to both parties equally, there’s more pressure on Republicans to limit spending, said Worth Hester, senior fellow and assistant director at Georgetown&apos;s Government Affairs Institute. “You can’t say we expect the executive branch to tighten its belt, but we’re not willing to tighten our belt,” he said. House lawmakers overall have paid staff an average of $2,480 per day in the 114th Congress, making the difference between Republicans and Democrats 6 percent of what’s spent on staff daily. Over the course of a year, that adds up to the average Democrat spending about $55,000 more than the average Republican. But some fall far above and below that average. At the bottom the House staff spenders list is first-term Iowa Republican Rep. Rod Blum. He’s spent just $1,473 a day on staff — about 60 percent of what the average member pays. Blum ended the first quarter of 2016 with 14 aides, including an intern and a temporary employee each making less than $1,000 a month, according to House disbursement records. Unpaid interns are not included in the records. The Iowa Republican has spent less on staff during this Congress than some members who entered partway through the 114th. GOP Reps. Trent Kelly of Mississippi, who replaced the late GOP Rep. Alan Nunnelee in June 2015, and Dan Donovan Jr. of New York, who replaced former Rep. Michael Grimm in May of that same year, have both spent more on staff than Blum. Blum’s office did not respond to multiple requests for comment. How much members spend on staff can differ because of salary variation, number of employees in an office, or a combination of both. Many chiefs of staff in the House, for example, are on track to make well over $160,000 in 2016, based on the House disbursement filings from the first quarter. But others are making closer to half that for their work, including the chiefs of staff for Democrat Joaquin Castro of Texas, and Republican Robert J. Dold of Illinois. House member offices also receive different budgets — known as members’ representational allowances — though each includes the same amount for staff pay. Members, however, can choose to spend that staff pay section of their budgets on other expenses, and they can use other money in the MRA for staff if they choose. Lawmakers in party leadership positions or who sit atop committees are able to hire staff for those separate offices without using their personal office allowances. Neither leadership nor committee offices were included in this analysis, but district employees were. Even with sharp differences in members’ spending, staffers aren’t flocking to offices known for higher paychecks, said one Democratic House aide who asked to remain anonymous. Instead, the aide said, staff members often find pay bumps by moving to a committee office or crossing the Rotunda to work for a Senate member. While Democratic members have tended to spend more on staff — they make up 37 of the 50 highest spenders on staff for the 114th Congress — a second factor may help explain why: experience. Experienced members have generally spent more than newer members in the House this Congress, and the average House Democrat outranks the average Republican by about four years. It’s not surprising then that the lawmaker spending the most is both a Democrat and a congressional veteran. 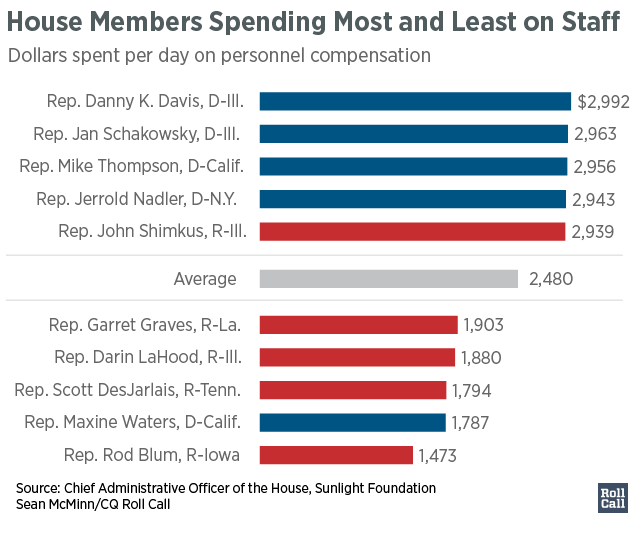 Rep. Danny K. Davis of Illinois, who was first elected in 1996, has spent $2,992 on staff per day in the 114th Congress — about 20 percent more than the average member. Before being contacted by Roll Call, Davis didn’t realize he was outspending his coworkers on aides. In fact, he said he wishes he could pay staff more. “They don’t earn very much, as a matter of fact,” Davis said. “I was surprised that what I pay is considered the highest, but I do have a lot of people generally stay in my office. They don’t stay a couple of years and be gone." Davis’s chief of staff made approximately $30,000 in the first quarter of 2016, while his communications and issues director made $20,000, putting them both on track for about $120,000 and $80,000 by year’s end, respectively. Quarterly totals may change as additional data is released. House offices sometimes disclose more spending for a particular quarter in filings later in the year. Another supporter of higher staff pay is Rep. Sam Farr, who successfully introduced an amendment that would increase members’ allowances by roughly $19,000 each to the now-passed House fiscal 2017 Legislative Branch appropriations bill. Still, the California Democrat said that 1.5 percent increase is not enough. Like Davis, Farr attributed his high spending on staff — he’s 25th in the House overall — in part to some of his aides staying with him for many years. State of Pay is an occasional series on congressional staff salaries. If you have stories to tell about congressional pay, email Sean McMinn at seanmcminn@cqrollcall.com or tweet him @shmcminn.